Samlex 1000W DC to AC inverter has a high efficiency microprocessor controlled DC-AC inverter converts 48 Volts DC (Nominal) to 1150 watts max of pure sine-wave AC power at 110 Volts, 60 Hz. 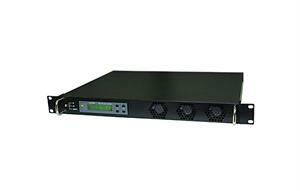 Samlex SR1000-124 rackmount DC-AC inverter has a high efficiency microprocessor controlled DC-AC inverter converts 24 Volts DC (Nominal) to 1000 watts of pure sine-wave AC power at 110 Volts, 60 Hz. 2 years warranty from Samlexamerica. Samlex UL listed pure sine wave inverter deliver clean AC current for heavy duty and commercial applications and for most light duty commercial, home electronics, marine and automotive applications. Samlex America pure sine wave DC-AC inverter is ideal for powering office equipment, television, DVD, Video Games, battery chargers and other sensitive loads from your car, truck, boat, RV, or Solar System batteries. SamlexAmerica pure sine wave inverter deliver clean AC current for most light duty commercial, home electronics, marine and automotive applications.